Semi-final week on The Great British Bake Off, and the Signature Bake for Round 1 is a layered sponge and mousse cake. My original recipe is listed on the BBC Food website, which was the version from the show and which was completed within 2 hours. This version varies slightly in that, without the time-pressures of competition, I have suggested a gelatine-set orange gelee for the top. This can look especially impressive as it means that the gelee stands proud of the surface of the cake, as if by magic. The instructions below are for a single, large mousse cake. The same quantity will also make 12 mini versions like the one pictured above, which stands about 6cm high. Instead of teeny tiny springform pans (I’m not even sure they make them that small), I used the ‘improvised baking rings’ (made from tinned peas tins) mentioned earlier in the Muffins post. Line two 45cm x 30cm (half sheet) baking trays with baking parchment and brush with the melted butter. Line the base and sides of a 25cm springform cake tin with baking parchment. Fold in the sifted flour then add the food colouring. Spoon the mixture into a piping bag fitted with a 5mm plain nozzle. Pipe the mixture onto the buttered parchment in a swirl pattern and place in the freezer to harden. Scrape the meringue mixture into a bowl and cover with cling film to prevent the meringue collapsing. Beat the almonds, icing sugar and eggs in the bowl for 5 minutes until the mixture is light and fluffy. Turn the speed down to low and mix in the flour and cocoa powder. Remove the baking trays with the decor paste from the freezer. Divide the batter evenly between the two baking trays, spreading it smoothly over the decorations and into the corners ensuring it is level. An offset spatula is useful for this. Turn out by covering the sponge with a sheet of parchment then flip the baking tray over onto the work surface. Peel off the paper to reveal the pattern, and lay it lightly on top of the sponge. Leave to cool. Pour the juice from the orange through a fine sieve into a small bowl and sprinkle over the gelatine. Set the mixture aside for three minutes then place the bowl over a small pan of simmering water, taking care the bottom of the bowl does not touch the water, and stir gently until the gelatine has dissolved. Place the chocolate in a large bowl and melt it in the microwave, stirring every 45 seconds. Mix the orange zest and egg yolks into the melted chocolate, then stir in the gelatine mixture and fold in the whipped cream. Whisk the egg whites until they form stiff peaks then gently fold into the chocolate mixture. Pour the mousse into the tin, level the surface and place the remaining sponge circle on top, pattern uppermost and chill in the fridge for at least two hours. Cut the gelatine sheets into small pieces and put into a bowl. Add 60ml of orange juice from the 300ml and leave for 10 minutes while the gelatine swells. Heat very gently in a saucepan until the gelatine has dissolved, then stir in the rest of the orange juice. Remove from the heat and set aside to cool. Don’t skip the cooling. If you try and pour the orange gelee over the cake before it has cooled and thickened slightly, it will just soak into the sponge. When the orange mix has cooled and is beginning to thicken, remove the tin from the fridge and slide a strip of food-grade acetate (or silicon sheeting) between the side of the springform tin and the sponge. Release the sides of the springform tin and peel off the acetate/silicon. Transfer to a serving plate . Whip the double cream to stiff peaks (be careful not to over-beat) and pipe swirls around the edge of the mousse cake. Cut thin strips of peel from the oranges and curl them around a straw. 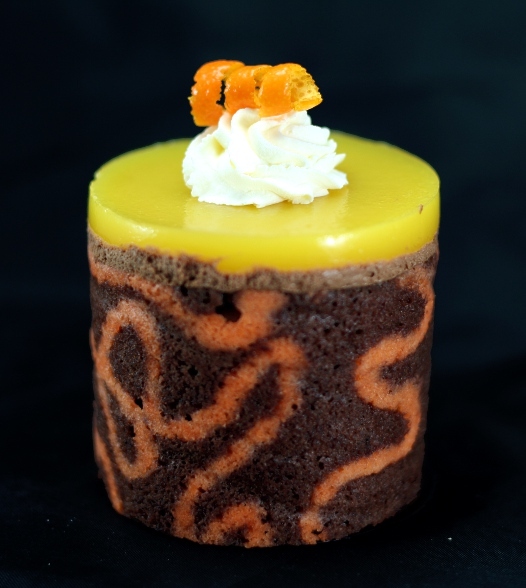 Decorate mousse cake with orange zest curls and dust with cocoa powder.